No worries because just as we can train our minds and bodies, we can also train our eating behaviors. I believe when it comes to developing a healthy relationship with food the goal is to develop and reinforce the core belief “I trust myself to nourish my body in the way in needs, and the trust myself to make the healthiest decisions for my needs” and have our behaviors fall in line with this belief. 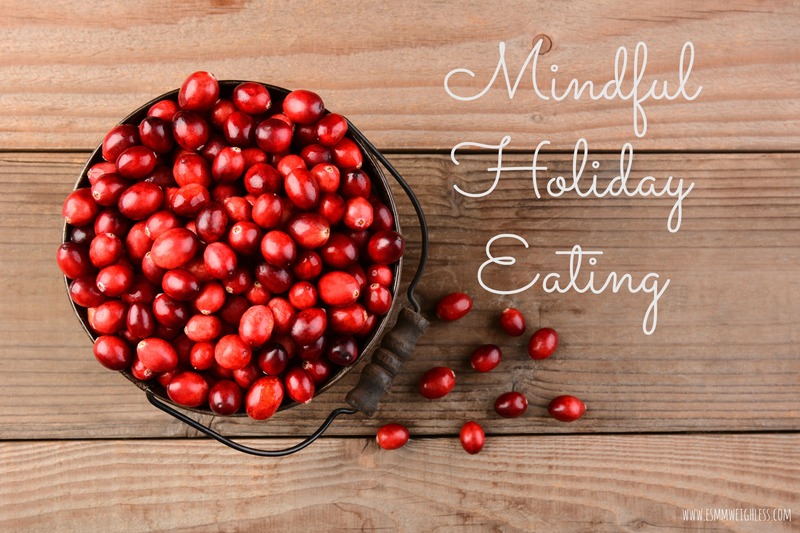 In this post I will share some tips for developing a healthy and mindful mindset with food for the holidays and anytime. Tip 1: First, be willing to believe that it is possible for you to improve and manage eating habits. I know it can be difficult to believe that it is possible when it has not happened yet, but just like you were able to learn to drive, run, ride a bike, or swim, this IS something you can teach yourself. It is possible! You can do this! Tip 3: Dedicate yourself to a Mindful Eating approach and lifestyle. When you are mindful you are fully present, in-the-moment without judgment. When it comes to eating, mindfulness helps magnify the awareness of your body’s cues so you can turn into when you are hungry (or when you are not) and full. Mindful eating will help get you out of “automatic pilot” mode where you tend to eat first and then become aware of what we eaten afterwards. Many social and environmental factors can stand in the way of being able to accurately interpret your body’s feedback ques. For example, you may be chatting with someone at a party while you are at the hors d’oeuvre’s table and mindlessly picking up more bites than you would like because you are engaged in a conversation only to realize later you feel more full than usual. Mindfulness helps you break free from mindless eating habits by examining the thoughts, feelings and internal sensations that affect how and why you eat (or don’t eat). Tip 4: Be Attentive. If you are going to eat then give 100% attention to it and avoid multitasking while you eat. You can be present around others and still be having your own food experience. You don’t have to get in on every conversation, but if you are in a conversation then put your plate down or the piece of food and be 100% attentive to the conversation or activity. Then go back to your food. If someone interrupts politely say, “I’m in the middle of eating do you mind if we pick up this conversation in a moment when I am done. Thank you.” When you eat, just eat. When you talk, just talk. Tip 6: Ask and Identify. Ask yourself if you really want this food in your body and how much you really want it. Identify what purpose does eating this serve me? Pleasure? Refueling? To try something new? Remember no-judgment here. You have a right to your own experience let’s just check-in regarding what experience you are creating. Tip 7: Observe and Take Mindful Bites. Notice how it looks, the textures, colors, how it smells and breathe in the aroma of the food. Reflect on where the food came from and how it was grown or made. Is it found in nature or is it synthetic, produced in a factory? When you bite into it what are the sensations you experience and tastes. Is it sweet, sour, crunchy, smooth, bitter, pleasant, and/or sticky. Taste and savor the flavor of the food you have chosen for yourself. Tip 9: Think mindfully about your eating experience. Try to encourage yourself and be aware of critical thoughts like “You shouldn’t eat this. You’ll get fat. ” Or “I’m so stupid because I ate two pieces of pie when I was trying to be mindful” that can creep into your consciousness. Just because you think these thoughts doesn’t mean they are true, and realistically no one or two meals will throw you off but negative thoughts can. Go back to your commitment and recommit the moment you notice you are being judgmental or critical of yourself. Remember: Thoughts are not facts. Tip 10: Praise your progress. When you are done and satisfied signify this by putting your utensils down or walking away from the food area. Then take a moment give yourself praise for taking good care of yourself and giving your body what it needs or wants ;). Each success no matter how small you think it is is worthy of praise and acknowledgement. Also, remind yourself that mindful eating does not mean you are a perfect eater. In fact, it means that you are consciously aware of the process and decision making behind your eating choices, healthy or otherwise. Remind yourself that each day you can and will make a healthy change. Remind yourself that you are the most important person to you. Remind yourself that you are worthy of a healthy relationship with food. And remember that change takes time. Be patient with yourself. Many of us were raised with some spoken and unspoken messages about food that shaped our eating behaviors and it will take time to be aware and if need be, change them. Please be kind to yourself as you start this courageous process. Shine on beautiful people and remember there is only ONE of you in this world so own your amazing uniqueness!